Llanfyllin TownLlanfyllin is small town flanked by the Cain and Abel rivers. Its reputation as a haven for alternative culture perhaps stems from its origins as an early Briton settlement, at any rate the holy well of Saint Myllin still gives the town a sense of its identity today. Llanfyllin derives its name from Myllin, a Celtic Saint of the 7th century. In 1293, Llewelyn ap Gruffydd, Lord of Mechain granted the town its borough charter and is one of only two Welsh towns (the other is Welshpool) to receive its charter from a native Welsh ruler. A thriving market town, it is an ideal centre to use as a picturesque base to explore the area including nearby Lake Vyrnwy, Welshpool and Oswestry. The town has all the amenities that it needs to sustain a very happy and content populace, with some excellent restaurants, cafes and accommodation as well as a weekly farmers market. This makes Llanfyllin a perfect place to use as a picturesque base to explore the Mid Wales coast, Snowdonia National Park or the Mid Wales marches border towns. Local attractions include the Llanfyllin Workhouse that was built in 1838. The Workhouse was featured on BBC 2's Restoration programme and has since transformed itself into a centre for arts, creativity and the environment. It houses the Workhouse History Centre, Wales's only workhouse museum, open daily free of charge, and is home to varied events including small-scale music festivals, horse shows and art exhibitions. Its 6-acre site includes a sensory garden and is used for ecological activities and courses. The cultural identity of Llanfyllin is further enhanced by regular open studio festivals that showcase the work of the many artists and artisans that have forged a community in the town. Anne Griffiths, the celebrated Welsh hymn writer, was born very near the town and has lent her name to several of the walking trails that explore the adjacent hills and vales. 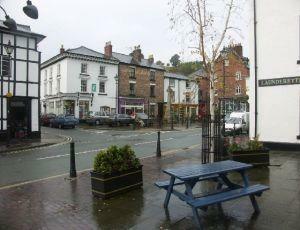 Llanfyllin is small town flanked by the Cain and Abel rivers. Its reputation as a haven for alternative culture perhaps stems from its origins as an early Briton settlement, at any rate the holy well of Saint Myllin still gives the town a sense of its identity today.